Aside from relaxing, eating, and watching football (and maybe getting ready for finals?! ), what else could/should you be doing? If you are done with the LSAT, then finish your applications! If you have everything you need to apply then there is no reason to procrastinate. This is a rolling admissions process — file your applications ASAP! If you are waiting on Letters of Recommendation, gently remind your recommenders that you want to submit your applications ASAP but cannot do so until LSAC/CAS receives all required letters of recommendation. Ask them when they can complete your recommendation. If you are taking the January LSAT — keep studying! A strong LSAT score helps both with admissions and scholarships! Set some goals for how many practice LSATs you can take over break and stick to it. Did you know that you can already apply for scholarships sponsored by non-university sources? Take a look at the scholarship spreadsheet with over 150 options over on our Compass page–these have a variety of due dates and many are due by the end of the calendar year, so now is a great time to apply! LSAT Prep. In general, we advise those planning to apply to law school next fall to take the June or July 2019 LSAT (unless study abroad prevents you from doing so). You should plan to spend approximately 4-6 months studying for the LSAT–so now is the time to prepare for that process. As you plan your schedule for Spring 2019, consider not overloading on courses since the time necessary for effective preparation equates to the time invested in a rigorous 3 credit class. Remember: the LSAT is NOT like the ACT or the SAT. It does not test what you know. Rather, it tests how you think. It is important to determine how you plan to study for the LSAT (on your own, through a commercial prep company, etc. ), and decide where you want to take the LSAT. To begin your research, go to the LSAC’s website for info on the LSAT, how to register and select a test site, and how to be successful on the test. Apply for Internships — Have you thought about what you will be doing next summer? Are you looking into internships? Internships can be a great way to build transferrable skills or learn more about the practice of law. Do you need some suggestions on how and where to find an internship? Check out this Internship Plan from our blog. And remember: the PLAS Annual Internship Newsletter will be out and published on Compass before winter break! Network and conduct informational interviews. A great way to start building your professional network and get to know various legal practice areas is to meet with lawyers! Do you or your parents know any lawyers? Are any of your friends’ parents lawyers? You can also use the alumni association directory to identify Illinois alumni who are lawyers. Ask a lawyer to spend 30 minutes doing an informational interview with you. Don’t be intimidated; this is an opportunity for you to buy him/her coffee and ask about their professional life. Here’s a resource for planning your informational interview. Apply for scholarships! We’ve included lots of scholarships for continuing undergraduate students. Take a look at the scholarship spreadsheet with over 170 options over on our Pre-Law Compass page–these have a variety of due dates and many are due by the end of the calendar year, so now is a great time to apply! Here are a few great scholarships with upcoming deadlines. Find these and over 160 more on our Scholarship Spreadsheet! The Levin Firm Scholarship application is due February 19. Law school applications are now open, which means that application season has officially begun! Those of you who are applying to law school now are finding out how expensive law school applications can be. Each school has an application fee and each school must receive a Law School Report ($45 each), which adds up fast. Here are our Top 6 tips for getting application fee waivers. Apply for an LSAC fee waiver. The best fee waiver is directly through the Law School Admission Council. This fee waiver will waive the fees for two LSAT exams, your Credential Assembly Service fee, and four Law School Reports. In addition, most law schools will waive your application fee too if you received an LSAC fee waiver. You can apply for an LSAC fee waiver and find out more information here. Attend the Law Fair. If you are not eligible for an LSAC waiver, there are other ways to reduce your costs. First, come to the Law Fair on Wednesday,September 26 from 10:00 a.m. to 2:00 p.m. at the Activities and Recreation Center (ARC). Over 100 law schools will be sending representatives to talk with interested students about their programs and their application process. Many schools at the fair will be giving out fee waivers! (Tip: Make sure you sign in at the law school tables. Many schools will email you a fee waiver afterward.) 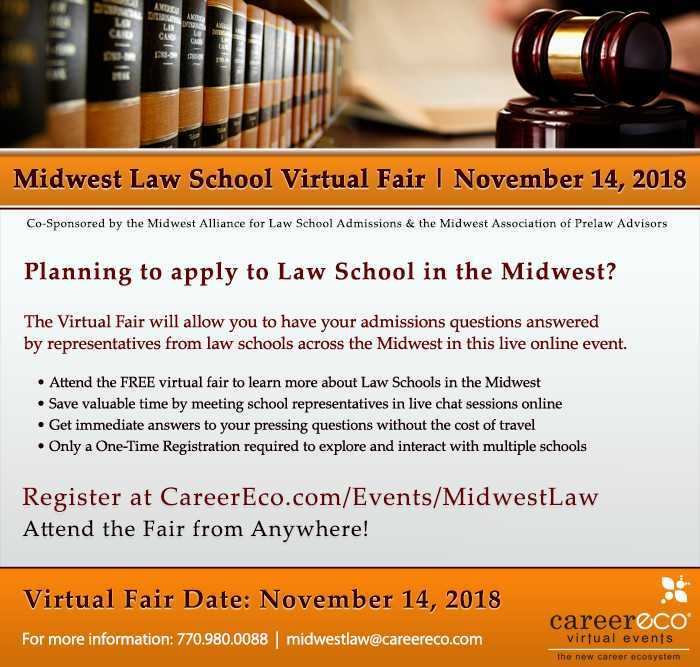 Click here for more details about the Law Fair, like which law schools are attending. Register for the Candidate Referral Service (CRS) in your LSAC account. This is basically a survey that asks you lots of questions about yourself–your background, interests, grades, etc.–and then “matches” you with law schools that are looking for students like you. Many law schools use the CRS to offer fee waivers, so it is worth your time to complete the CRS survey here. Directly inquire with your preferred law schools. Send a polite email to their admissions office asking whether they have a fee waiver program, and how you can apply. Some schools will simply respond with a waiver; other schools will have certain parameters (like GPA or financial need) to meet before waiving your fee. Take 10 minutes to craft a friendly form email and send it to all of the schools you’re applying to–it’s an easy way to collect a few fee waivers. It’s well worth your time. Attend law school visit or open house days. Sometimes when a school sees that you’ve made the effort to visit, they will reward you with a fee waiver. Join the Pre-Law Facebook Group. Sometimes law schools send our office fee waivers, and we always post them to our FB group on a first-come, first-served basis. Click here to join! Scholarships, Scholarships and More Scholarships! Who doesn’t want or need additional scholarship money to pay for law school?! There is no time like the present to apply for scholarships. First up — the Chicago Bar Foundation Marovitz Public Interest Scholarship. What about those of you who are looking for additional funds to support your undergraduate education? Could you use an additional $500, $1000, or even $40,000 towards your undergrad or legal education? Whether you’re heading off to law school this fall or staying here to continue your pre-law education, you’ll want to see this resource. We have compiled over 200 scholarships available for BOTH incoming law students and pre-law undergraduates. Below are some examples. Head over to our Compass page to find the full listings–but hurry, because some have upcoming deadlines! Here are just a few examples of the scholarships available. Go to the Compass page for more details on how to apply. American Association for Justice’s Richard D. Hailey Scholarship provides $5,000 to an incoming or continuing minority law student. Applications due May 1. Dwyer Williams Dretke is offering a $1,000 scholarship for an incoming law student. Deadline to apply is July 1. The Levin Firm is offering a bi-yearly $1,000 scholarship to individuals currently attending or planning on attending an accredited United States college or graduate school in the near future. Deadline to apply is August 15. McNeely Stephenson’s Legal Scholarship Award provides $1,000 to an incoming law student who has written an article that has been published in print or digital media. Deadline to apply is May 1. Head over to our Compass page to explore more scholarship opportunities! Are you narrowing your list of law schools that you plan on attending for Fall 2018? Unsure of how to tell the difference between some schools? Making a final decision can be stressful. If you feel like you need more information about a law school, consider looking at their Standard 509. We also more information about how to access Standard 509 reports on our Compass page. Using all the Illinois Law Schools Standard 509 documents, here are some ways you can utilize this resource and narrow your choices! The three topics we looked at included: on campus cost of living, conditional versus non-conditional scholarships, and transfer rates. Hello Pre-Law Students! 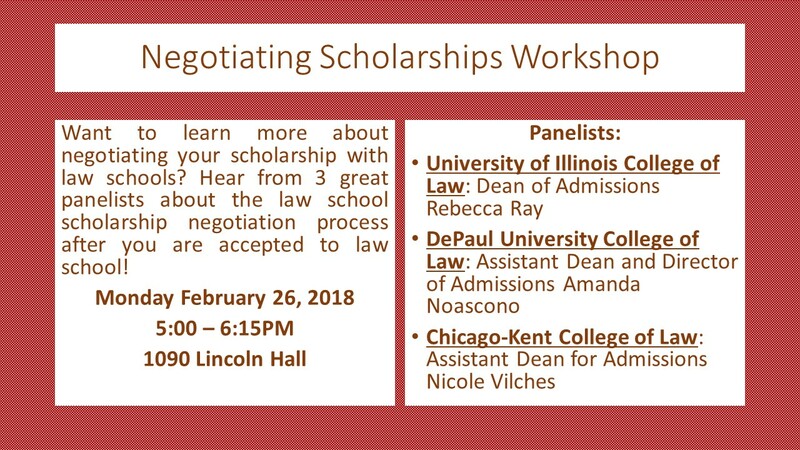 Don’t forget tonight’s PLAS “Negotiating Scholarships Workshop!” Also — at least two summer pre-law programs have application deadlines of THIS THURSDAY, MARCH 1. Scroll down for info on these items as well as other opportunities! 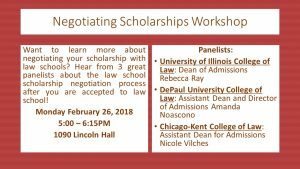 Our next event, “Negotiating Scholarships Workshop” is TODAY, Monday February 26! The event will be held at 1090 Lincoln Hall from 5PM – 6:15PM. A preview to our March event . 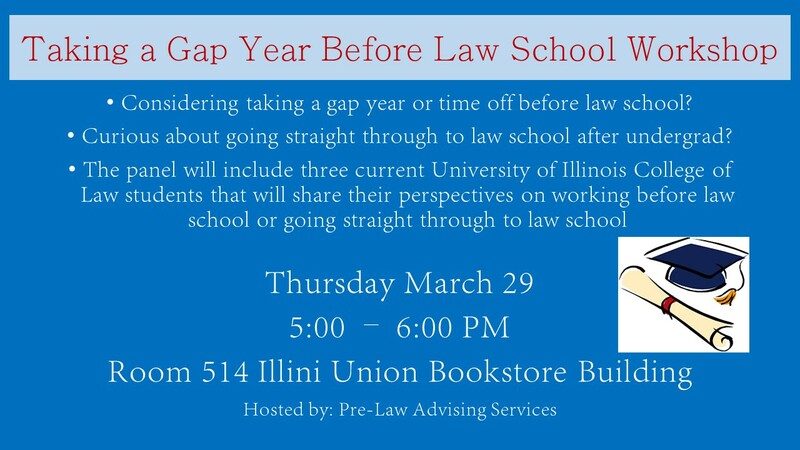 . . the “Taking a Gap Year Before Law School” Workshop will be on Thursday March 29th in Room 514 of the Illini Union Bookstore from 5:00 – 6:00PM. Are you considering working or taking a gap year before law school? Do you want to know more about going straight through to law school after undergrad? Pre-Law Advising Services is hosting an event for students to learn more about different paths to law school. The panel will feature three current law students–two with work experience and one who went directly from undergrad to law school–to answer your questions and discuss the pros and cons of going straight to law school versus taking time off and working. SUMMER PLANS–Still looking for opportunities? Check these out. Career Fairs. Mark your calendars for spring career fairs, which are open to all Illinois students and present both job and internship opportunities. Find these and other fair opportunities in Handshake. Research Park Career Fair–March 13. Visit their website here. Just-in-Time Illini Career & Internship Fair–April 10. Visit their website here. Chicago-Kent PLUS program. Applications due THIS THURSDAY, March 1. University of Wisconsin PLUS program. Applications due April 13. Indiana ICLEO Summer Institute. Applications due THIS THURSDAY, March 1. June LSAT Registration–Planning to take the June LSAT? Registration is now open here! We recommend registering early because this one typically fills early AND LSAT takers were up nearly 30% last year! Now is also a good time to apply for a fee waiver. For more on LSAC fee waivers revisit this blog post. Did you know that you can get a scholarship for working at an unpaid internship this summer? Apply for the Fred S. Bailey scholarship here, which provides a $1000 stipend for part-time internships and a $2500 stipend for full-time summer internships. Applications due April 12. It is encouraged that students have Friday afternoon availability for the Fall 2018 and Spring 2019 semesters. For more information and to apply, visit their website here. OIIR’s Lunch on Us Program – Free Lunch Every Weekday! The Office of Inclusion and Intercultural Relations is offering their “Lunch on Us” program this semester. Programs take place every weekday from noon to 1pm every day and offer a free lunch for attending. To see their schedule, click here. During an interview, you only have a short time to convey you are a great fit for a position or organization. Learn the most common types of interviews, how to prepare for an interview, how to structure answers to interview questions, and tips for following up after an interview. Cover letters are challenging to write, and yet, are often a critical aspect of an internship or job application. Learn how to write an effective cover letter that showcases your skills and experiences for a specific position. This exciting workshop will teach you how to use helpful job search resources such as LinkedIn, Handshake, and Myvisajobs.com. Learn to create an appealing profile on LinkedIn and use it for career exploration, networking, and information interviews. You will also learn to identify international-friendly companies. Please bring your laptop. Interested in other Career Center workshops concerning resume reviews, Peace Corps information and more? Go to the Career Center website to find other programs!